Rated 5 out of 5 by terryg1582 from Love this color! I dyed my hair this color about 3 weeks ago and its still going! I might dye it again the same color. Rated 1 out of 5 by nerdy_nana from not satisfied I bought this a couple of days ago. My hair color was light brown, more light auburn. 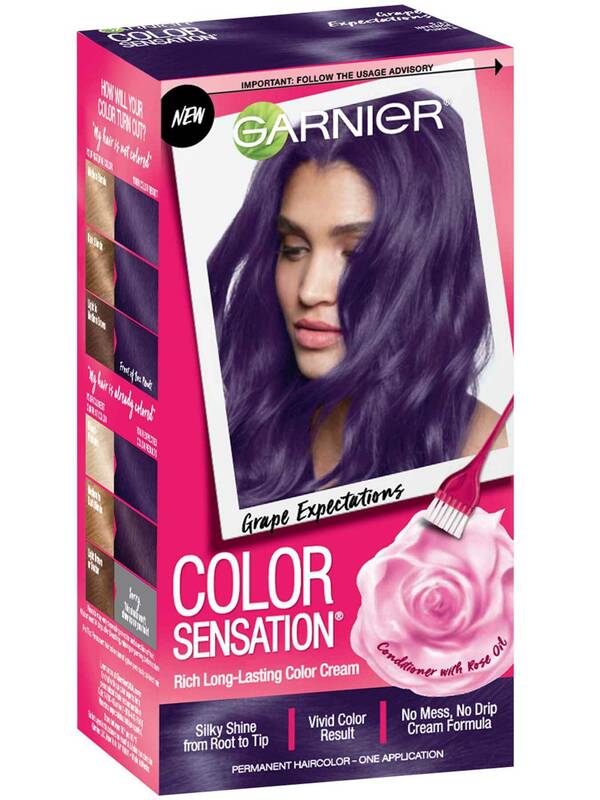 I felt that my hair color matched the color on the side of the box, so I bought the purple. My hair color came out almost black to dark brown. Rated 5 out of 5 by PhilNY from Love it and wont go back to any other dye I love this product. Came to Garnier because another product failed - I shan't say which one. I am a male with golden blonde hair that goes almost to my waist. 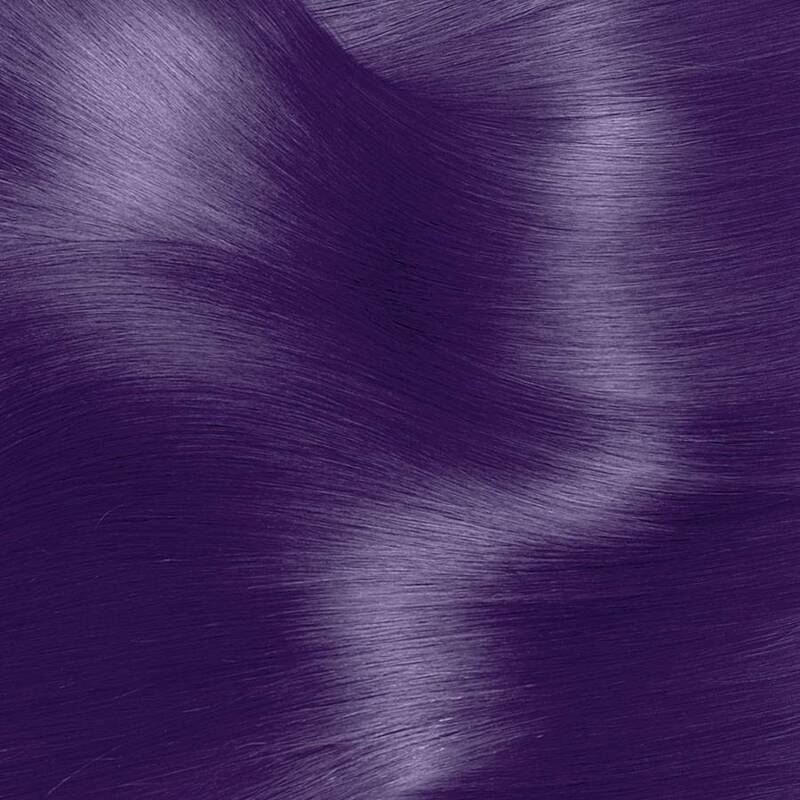 When I was looking for a new permanent dye it was between this one and another. I wrote to both companies. Garnier had an actual rep talk to me on the phone and she answered all my questions. The other wrote back and said they cannot answer the questions, they just make it. Yeah. I decided to go Purple and I bought a package that had 3 boxes in it because I knew I would use two boxes. Application was easy and fast. I, however, am the messiest person with hair dye. I did do a few things differently. I combined the ingredients and shook it up but then I put it in a dye pan so I could use the applicator brush easier. After the first bottle I got impatient and then just used my hands, my gloved hands, with the second bottle. There was no bad smell or stinging and for days it smelled great. It came out slightly darker than I expected but that is more than ok. It also depends on the light when you look at it. Outside you could really see the purple. After when I washed I used color safe shampoo and on other days I used dry shampoo - on dry shampoo days I wore a shower cap in the shower. It has been almost three weeks and the fade is super gradual from a dark purple to a lighter purple. I love how gradual it is and it is like I am getting a new color in a way. I have one box left so in another three weeks or so I will use that to brighten up the color. I have attached some pictures. My hair was still a bit wet when I took them. I am sorry that they are not the best pics. My one complaint, if I can call it that, is I wish Garnier had a better selection of Color Sensation colors. More Outrageous colors like the purple, hint hint. Overall I would be hard pressed to be any happier! Rated 3 out of 5 by _queenkara_ from Bought this from rite aid. I have died my hair crazy colors a lot but usually bleach before. I actually had medium brown to blonde hair and it turned out a pretty dark purple. I’ve washed it once and can tell it’ll fade quick to a dark brown and then I’ll have to bleach to do again. So that’s why I give it a 3. Rated 1 out of 5 by Pinkticus from Nope, nothing. My daughter has medium to dark blonde hair. She was well within the shade range on the box. We followed the directions and I only dyed the under part of her hair where it's a little darker. I can't tell where the color begins or ends at all. Her hair looked the same as it did before with the exception of a very slight rosy tint. We were both very disappointed. Rated 5 out of 5 by tanyadiane from I received this complimentary for testing purposes. For a non-professional product it worked well. I think the color could have been pigmented better. But I could see the teal.